Modern DDR3 SDRAM. Source: BY-SA/4.0 by Kjerish During my recent visit to the Computer History Museum in Mountain View, I found myself staring at some ancient magnetic core memory. This article presents efficient, pass-transistor-based implementations of important digital functionality. 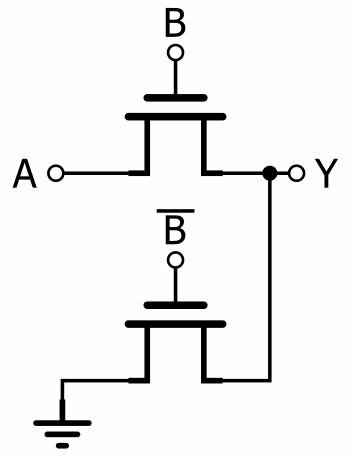 In a previous article, I introduced the concept and basic characteristics of pass-transistor logic (PTL). FTDI chips are frequently used as USB-to-serial adaptors, but the newer devices have the ability to drive more complex protocols such as SPI and I2C. The following posts demonstrate a step-by-step approach to driving the FTDI chips from Python, to learn about their functionality. Recently, I have been working on my EFI GPT boot code and needed to update the image files. Throughout the years, I have made many utilities to create and/or modify various images and file formats. When our son was about three or four years old we started expecting him to do things in a timely manner. I would say things like “We need to go in ten minutes!” or “Play with that truck for five more minutes, and then give someone else a turn”. Ground is an interesting topic when it comes to engineering. See lot of maze from kids books to automatic maze solving robot. Here i try some thing differently where solve a maze using laser reflection. When at start i think its very easy but do it in cheap it cost more time for accuracy. The concept of creating a gaming portable out of a home console has been around for some time, but it’s hardly seen the other way around. There have been a few devices that dared to straddle the line (i.e., Sega Nomad, Nintendo Switch, etc. ), but the two worlds typically remain separate.